A man, while playing PUBG met with a girl who was also a big fan of the game. As things stand, they are now engaged to be married. PUBG, also known as Unknown's Battlegrounds, is a very popular battle royale game. This truly addictive game has people hooked to it for hours on end. Things have reached a stage where even governments are giving instruction to schools to keep children away from the game and prevent them from getting a prolonged exposure to the gameplay. But this is one news that will probably warm the heart. 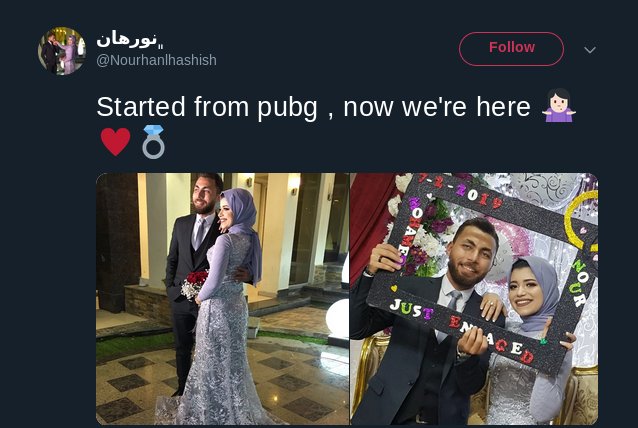 A man, while playing PUBG met with a girl who was also a big fan of the game. As things stand, they are now engaged to be married. Nourh-al-Hashish shared his story on his Twitter handle @Nourhanlhashish. Nourh tweeted on Twitter about the engagement, "We started with PBJ and now we have engaged." With this, Noorhan has posted two photographs of him and the girl.